This has been a year with a considerable amount of bad—the loss of friends and loved ones, ongoing health problems for me and many of those close to me—but also plenty of good, mostly due to the love of friends and family. We hang in there and keep going, and there are good times along the way. And a number of things to report in the areas which this blog addresses most of the time. I reached the million word level again this year for the 14th year in a row. When I started this streak, I just wanted to see if I could actually write a million words in a year. I had come close the year before, somewhere between 800,000 and 900,000, so it seemed at least possible. Then once I accomplished that, and once the years doing it began to pile up, I just kept going. Ten years seemed like a pretty good goal. When I passed that and made it to 13 years, I didn’t want to stop there. (Yes, I’m that superstitious.) So I had to try to make it again this year, and I did, with a little more than a week to spare. (Gone are the days when I’d hit a million words sometime in October!) Next year, who knows, maybe, maybe not, but I’m in the process of cutting back some on my commitments because there are still things I’d like to do besides sit and pound the keyboard. 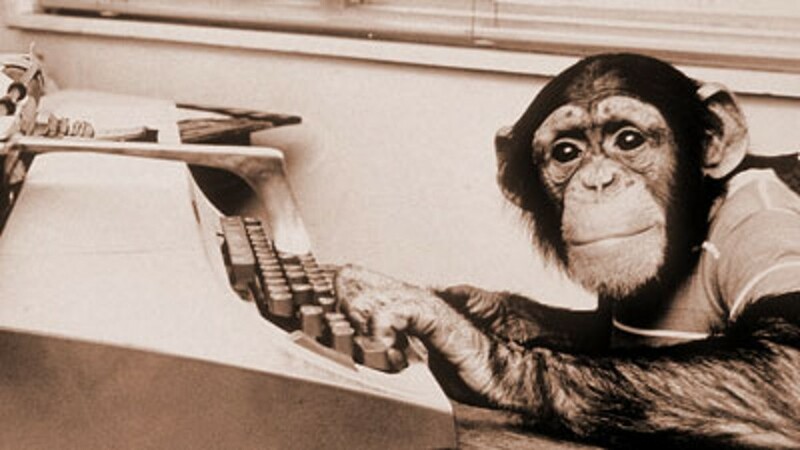 Although I still love writing, don’t get me wrong about that. Most of my work is published under other names, as has been the case for many years, but I was able to do a few short stories as myself that haven’t seen print yet but will next year. I’m still the luckiest guy I know, to be able to do what I really enjoy and make a living at it. I read 115 books this year, the usual mix of Westerns, mysteries, thrillers, science fiction, horror, graphic novels, and assorted other stuff. Looking back, I read 116 books last year. I was surprised the total was that close. I’m consistent, if nothing else. More than ever, I’ve retreated into the safe havens of pulps, pulp reprints, and vintage paperbacks and hardbacks, the same sort of stuff I’ve been reading and enjoying for nearly 60 years now. Amazingly enough, I hardly ever reread anything. There’s still more good old stuff out there than I’ll ever get around to reading, but I’m going to try. I do still read new books, too, especially those by friends of mine. Below are the ten books I read this year that I liked the best, in the order in which I read them. You can see what I mean about pulps and vintage paperbacks. There are three new books on that list, the two by Will Murray that feature pulp characters, and the non-fiction volume by Alec Nevala-Lee that’s about a pulp, the man who edited it, and the authors who wrote for it. I believe that all ten books on this list are currently in print. I didn’t check on this, so bear with me if I’m wrong on one or two of them. But you can still find copies pretty easily if you want to check out any of them. Honestly, it was a struggle to find time to watch many movies this year, which led to me participating only sporadically in the Overlooked Movies/TV posts. More next year, perhaps. The really odd thing about this year is that in late October, literally from one day to the next, the daily traffic to the blog dropped by roughly two-thirds. I have no idea why this happened. I realize that with the rise of Facebook and other social media, blogs aren’t nearly as popular as they were a decade ago, but that sudden drop is both baffling and discouraging. However, just in the past few months, several people have contacted me out of the proverbial blue to tell me how much they enjoy the blog. One fellow said, “I’ve learned a tremendous amount about pulps and genre fiction from reading Rough Edges and enjoyed every minute of it.” As long as I’m accomplishing that, I consider the time very well spent, and if it ever gets to the point where only a dozen people are reading it, as it was in the beginning, well, that’s okay, too, as long as they’re enjoying it. As I’ve said about the WesternPulps mailing list, which has been through E-Groups, One List, Yahoo Groups, and now Groups.io, “I started this group sending messages to myself, and I’ll keep it up until it reaches that point again.” My mother always said I was the most hard-headed person she had ever seen. So to all of you still with me, thank you for your friendship and interest, and I’ll see you next year. May it be a good one for all of us! 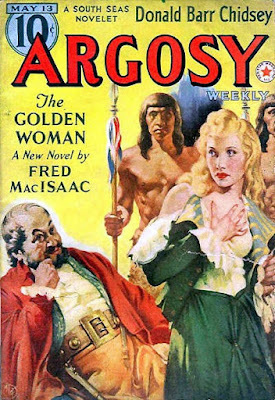 For the last pulp post of the year, we return to an old favorite magazine, ARGOSY. I'm not quite sure what's going on in this cover by Marshall Frantz for the May 13, 1939 issue, but it's intriguing, I'll give it that. And I'm sure the stories inside are pretty good, too, since the authors include Donald Barr Chidsey, Hugh Pentecost (Judson Philips), Philip Ketchum, Fred MacIsaac, Richard Sale, and Bennett Foster. That's a really good lineup. I'm in a bit of a melancholy mood these days, for various reasons, and this is a really pretty but also melancholy song. A lot of different singers have performed it, but I don't know of a version better than this one by Randy Newman, who wrote it. To wrap up the year for this series, this is a pulp that I own and read recently. The scan is from the issue I read, ragged cover edges, scribbling, and all. Anybody who’s read this blog for very long knows that TEXAS RANGERS is one of my favorite Western pulps and Jim Hatfield is my favorite Western pulp character. I’ve been reading his adventures (first in the paperback reprints from the Sixties) for a very long time now. The Hatfield novel in this issue is “Pecos Poison”, written by Tom Curry under the Jackson Cole house-name, and behind that very generic title is an interesting and effective yarn about the conflict between coal miners and ranchers in West Texas. 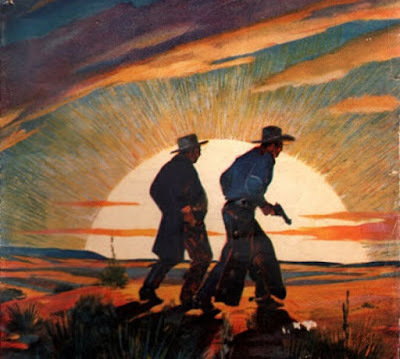 This particular mine is about played out and isn’t valuable, so far as anybody knows, but somebody is conspiring to steal it anyway and is using rustling and the friction between miners and cattlemen as a distraction. Jim Hatfield is sent in to get to the bottom of the trouble and works undercover to begin with, as usual. Also as usual, Curry employs a proxy hero, young miner-turned-cowboy Bert Webb, to carry part of the action while Hatfield is off investigating other angles. There’s plenty of action, and the main villain in this one (there’s no secret about his identity) is particularly dastardly, using a couple of murder methods you don’t often find in pulp Westerns. It all leads up to an explosive and very effective underground climax in the coal mine. There are also four short stories in this issue. The first, “Widow’s Choice” by William Morrison (who was really Joseph Samachson), concerns the rivalry between two prospecting partners over the affections of a widow who may not be much to look at, but she’s a great cook. Then things are complicated by an Indian attack. This is a pretty lightweight tale that takes a grim turn part of the way through, then eventually swings back to humorous fare. I’m not sure it completely works—it’s a little bit too schizophrenic—but it’s a readable story. “Ranger’s Ruse” by Charles N. Heckelmann is a murder mystery, as a miserly moneylender is shot in the back and a Texas Ranger has to figure out which of three suspects is the killer. It’s not much of a whodunit, since Heckelmann keeps information from the reader that would make it possible to solve the mystery, but it’s another one that reads okay. “Range Waif” by W.E. Carleton is a contemporary Western comedy about rival dude ranches competing for customers. It didn’t work for me at all and I didn’t finish it. This issue wraps up with “Sodbuster’s Showdown”, a short story by Frank Morris. 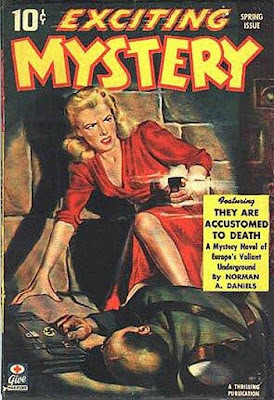 In a post earlier this year about an issue of HOLLYWOOD DETECTIVE, I wrote about how there seem to be two Frank Morrises, one who wrote for a variety of Western pulps from the mid-Thirties to the mid-Forties, and another who was a house-name for the Trojan pulps. The author of “Sodbuster’s Showdown” is almost certainly not the same person who wrote “Location for Murder” in that HOLLYWOOD DETECTIVE. But it’s a good story anyway, about a small rancher (not really a sodbuster, despite the title) who clashes with a brutal cattle baron over water rights. There’s quite a bit of well-written action, and while overall the story is nothing out of the ordinary, I enjoyed it. It’s the best of the short stories in this issue. 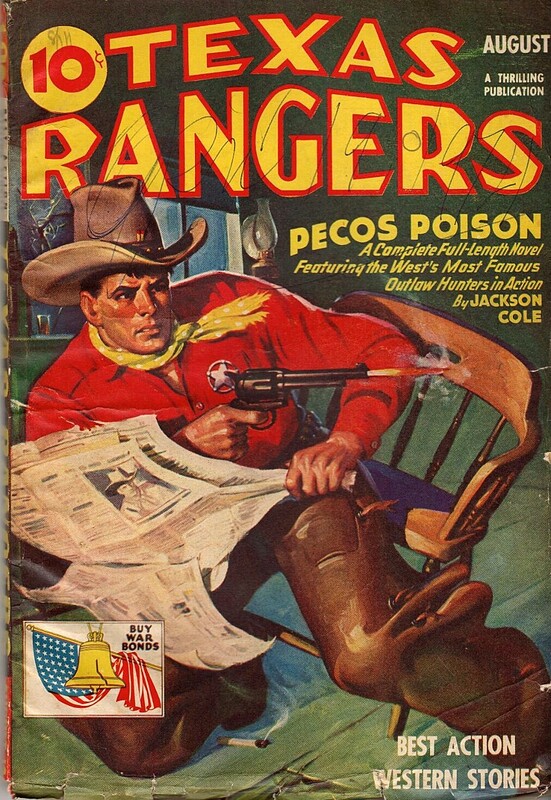 So while this is maybe a slightly below average issue of TEXAS RANGERS because of the back-up stories, the Hatfield novel is a good one, and that’s the main appeal of TEXAS RANGERS to start with, so I enjoyed this one and think it was well worth taking down from the shelves. 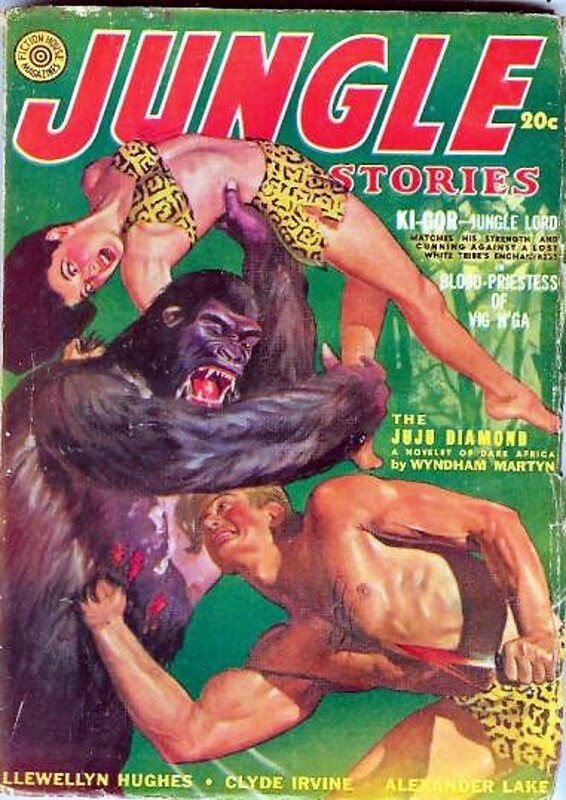 For the final Forgotten Books post of the year, we return to a series I’ve really enjoyed: the fourteenth Ki-Gor novel, BLOOD PRIESTESS OF VIG N’GA, from the Summer 1942 issue of JUNGLE STORIES. This is generally regarded as one of the best yarns of the entire series, and I can see why. It begins with Ki-Gor and Helene searching for an anthropologist friend of theirs, David Gray, who has gone missing. (Gray previously appeared in the novel KI-GOR—AND THE PARADISE THAT TIME FORGOT.) They have received word of Gray’s disappearance through the secret society to which Ki-Gor belongs, the Brotherhood of the Dog (a reference to KI-GOR—AND THE TEMPLE OF THE MOON GOD). After a dangerous encounter with a gorilla, they run into a native who tries to kill them, a fracas that alerts them to a possible uprising led by a fanatic known as El Hakim. This is going to complicate their search for David Gray, and so will their discovery of the remains of a 900-year-old Viking ship in a dry riverbed. It won’t come as a surprise to anyone that from that point, BLOOD PRIESTESS OF VIG N’GA turns into a Lost Race novel, and of course we all know from reading Edgar Rice Burroughs that Africa is just teeming with lost races and civilizations. With a plot like this, a story’s appeal depends almost entirely on the author’s skill in executing it, and the unknown pulpster responsible for BLOOD PRIESTESS OF VIG N’GA does a great job with it, keeping the action moving at a very satisfying pace and providing some epic action scenes along the way, especially when Ki-Gor battles his enemies using one particular weapon retrieved from that old Viking ship . . . I have no idea who wrote this story. The references to those earlier entries in the series might indicate that the same author did all three, or it might not. Whoever wrote this one might have just read those earlier stories. There’s no mention of any of the regular supporting cast, only Ki-Gor and Helene. But the author does a very good job of capturing their characters. Helene’s no dummy in this one; for the most part, she’s smart and competent, although she does wind up getting captured and having to be rescued. That was just standard pulp plotting, though. My only real complaint is that the ending seemed a little rushed, as if the author realized that the story was getting too long. I also have a hunch that the cover was done before the story was written, because while the fight with the gorilla depicted on the cover does take place in the story, it’s a throwaway scene that doesn’t really have anything to do with the rest of the novel. Although I missed Tembu George, the writing in this story is good enough that I have to say it’s the best Ki-Gor yarn I’ve read so far. I’m looking forward to continuing with the series. Regular readers of this blog know that December 27th is the anniversary of my first fiction sale. (I had been paid for my writing before that, a small sum for movie reviews in the local weekly newspaper, but I’m a fictioneer and so December 27 is the anniversary that I count.) This year marks 42 years in the business for me. Starting out, I hoped my career would last a long time, but I had no idea if it would, of course. That first sale might have been the only sale. Nothing is guaranteed in this business, or any other. But somehow, I’m closing in on 30 million words written and sold in my career, and I’m incredibly thankful for the opportunity to have done so. It never would have been possible without Livia, Shayna, and Joanna, as well as all the editors who have put their faith in my abilities and the readers, God love each and every one of ‘em, who have plunked down their hard-earned cash for my books. So thanks to all of you, and while I may slow down a mite, I’ll still be here at the keyboard for a good while yet, I hope. Set on the sunny Gulf Coast of Florida, Harbinger centers around two lifelong friends and fishing charter boat partners, Boyd Tomlin and Hicks Ledoux. Boyd is the serious one who always makes sure things get done, and Hicks is the carefree one who always makes sure everyone has a good time. But times aren’t so good. They are struggling to get charters, and bills are coming due. In desperate need of money, they consider smuggling drugs to make ends meet. By chance or fate, they meet two beautiful sisters who will change everything—a young Ania and her kid sister Karolyn. Hicks is immediately attached to the brash, confident Ania while Boyd gravitates toward Karolyn. As romance blossoms, Boyd and Hicks quickly find themselves embroiled in the world of illegal drug trade, romance, danger and violence lurking around every corner. This is some serious Florida noir here, reminiscent of John D. McDonald, Day Keene, Gil Brewer, and Charles Williams. 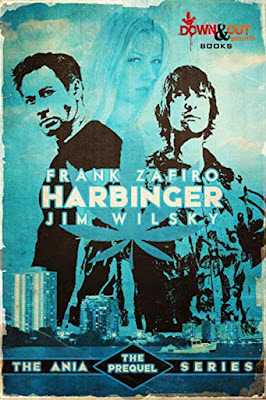 It's the latest book in the popular Ania series by Frank Zafiro and Jim Wilsky, but if you haven't read any of the others (and they're all good), that doesn't matter because chronologically this is the first book in the series. 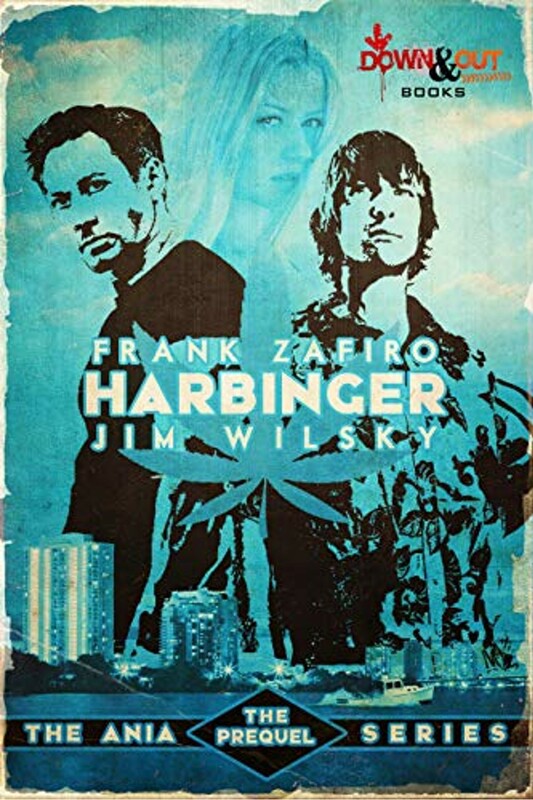 Told in alternating first person chapters by the two protagonists, Boyd and Hicks, HARBINGER is very well written, a little humorous in places but mostly poignant and tragic, with an excellent twist late in the game that I didn't see coming. Ania is a fascinating, unusual character, and this bit of back-story on her is very welcome. I liked HARBINGER a lot and think it's a fine example of contemporary crime fiction. Merry Christmas to all of you, and may Santa bring you plenty of good books to read. Remember what I said a couple of days ago about the kid on that RANCH ROMANCES cover reminding me of me? Well, now you can see why. 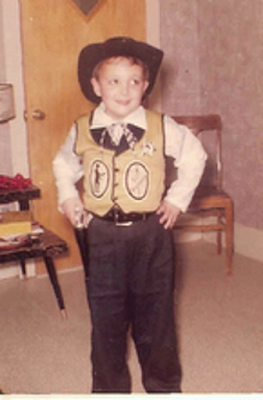 Yes, that's me, wearing my Bat Masterson outfit. I know this picture was taken on Christmas Day, and I'm pretty sure the year was 1959, which would make me six years old. I'm also certain it was taken in the living room of my Aunt Annie's house in Blanket, Texas. I'd gotten the outfit as a Christmas present that morning and insisted on wearing it when we went to Blanket. I was a big fan of the TV show starring Gene Barry. I also had a Kit Carson outfit and numerous toy guns based on guns used in various Western TV shows. So it's not the least bit surprising that I turned out like I did. A little while ago, I reached the million word level for this year, which makes fourteen consecutive years I've written that much fiction. Every year I think I'm not going to make it, and then I do. Every year I say that I probably won't write that much next year. Well, I do need to write that much next year, or at least pretty darned close, and you know if I get close I'm going to go for it. But year after next, now . . . Yeah, that's my story. Year after next. Thank you to everyone who makes this possible, especially Livia, Shayna, and Joanna. I couldn't do it without you. Even though this issue of 10-STORY DETECTIVE MAGAZINE is cover-dated February 1946, that's the off-sale date, and since it was a bi-monthly, that means this issue actually hit the stands early in December 1945. And the cover by Ernest Chiriacka makes it clear this is a Christmas issue. The biggest names among the authors are Talmage Powell and Joe Archibald. 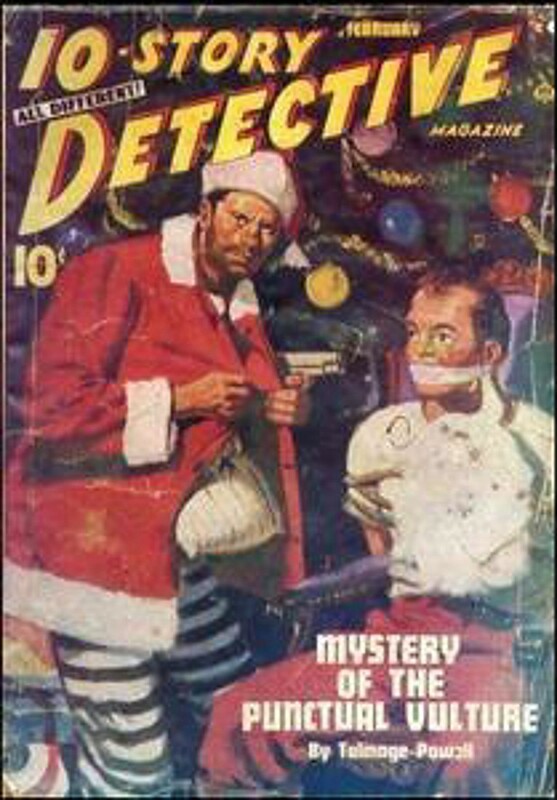 Victor White is also on hand, writing under his Ralph Berard pseudonym, and Glenn Low has two stories in this issue, one under his name and one as Davisson Lough ("A Slay for Santa Claus", judging by the titles, the only Christmas story in the issue). 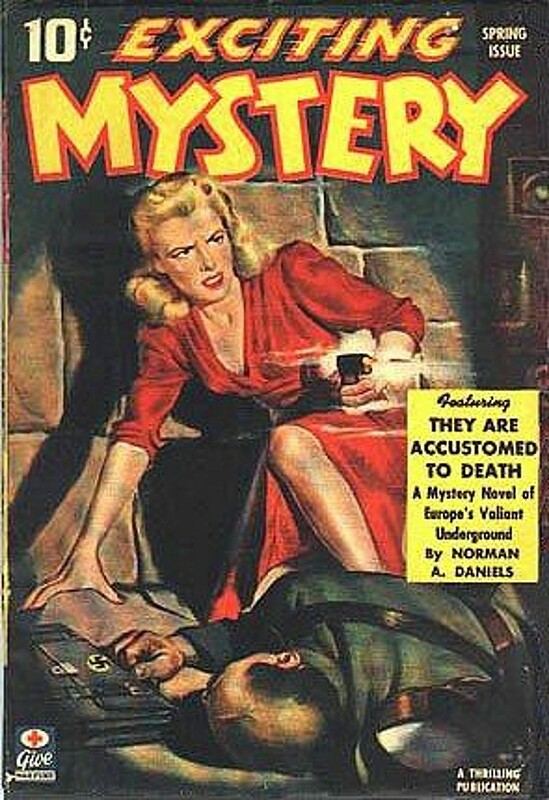 Larry Sternig, who is best remembered as a literary agent, wrote a number of stories for the pulps as well, and one of them is in this issue. The other authors are all folks I've never heard of. Not that impressive sounding an issue, but that's the thing about the pulps: you never know. It might have been great. This is a pulp that I own and read recently. Since it’s a Christmas issue, it’s appropriate to the season, and anyway, the little kid on the cover reminds me very much of, well, me. 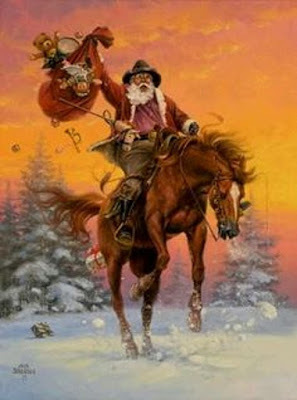 I frequently asked Santa to bring me toy guns and cowboy outfits for Christmas. The scan is from the copy I read. The featured novella is “Cowtown Cavalier” by Paul Evan Lehman. The protagonist, Ken Mason, is searching for the crooked banker who ruined his father when he winds up involved in a range war between a beautiful young woman and a greedy cattle baron, an express company robbery, and several murders. I’ve always thought of Lehman as one of those competent, reasonably entertaining writers whose work doesn’t leave much of an impression. This novella is a little above that level, because it’s actually a well-structured mystery in addition to being a good action Western yarn. There are a number of suspects, the hero does some decent detective work, and it winds up being a pretty satisfying mix. This may be the best thing I’ve ever read by Lehman. Frank C. Robertson had a long, very successful career as a Western writer, both as a pulpster and a novelist. 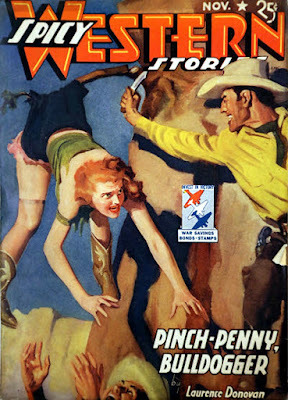 His short story, “Taming of Cat McCoy”, is a slight yarn about a bitter, ex-con bronco buster who finds love and redemption. 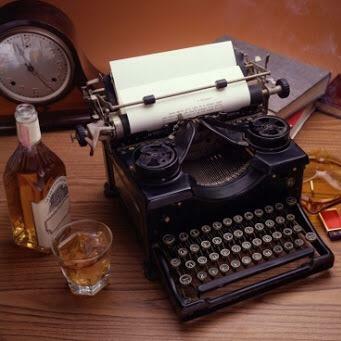 But it’s very well-written and goes down easy. I just wish there had been a little more to it. I need to read more by Robertson. Elsa Barker has an actual Christmas story in this issue, “Sheriff for Christmas”, which is about a schoolteacher who turns down a marriage proposal from the local sheriff because her father was a lawman and she’s afraid she’ll worry herself to death like her mother did. And sure enough, before the story is over, the sheriff who proposes to her does wind up in danger. I don’t recall if I’ve ever read anything else by her. She was a prolific contributor to RANCH ROMANCES, and her career goes all the way back to THE SMART SET in 1901! This is a pretty good yarn, predictable but well-written, and it has some nice Christmas spirit to it. I haven’t been impressed by the science fiction and fantasy I’ve read by Robert Moore Williams (the genres for which he’s best known), but his short story in this issue, “The Trail Home”, isn’t bad. It uses the old plot of the outlaw who has gone straight and is trying to cover up his past, only to be forced by circumstances to buckle on his guns again, but Williams does a pretty good job with it and produced an enjoyable yarn. “Duchess of the Salty Dog” is by an author I hadn’t heard of, Pat Johns. That’s probably because Johns (don’t know if that name is male or female) published only a few stories in RANCH ROMANCES and nowhere else. This one has an intriguing protagonist, a former saloon singer who gets involved in rustling and a dangerous ambush, but in the end I didn’t think it amounted to much. There are two serial installments in this issue. I normally don’t read serials unless I know I have all the parts, so I skipped the first installment of “Desert Quest” by Dorothy L. Bonar. 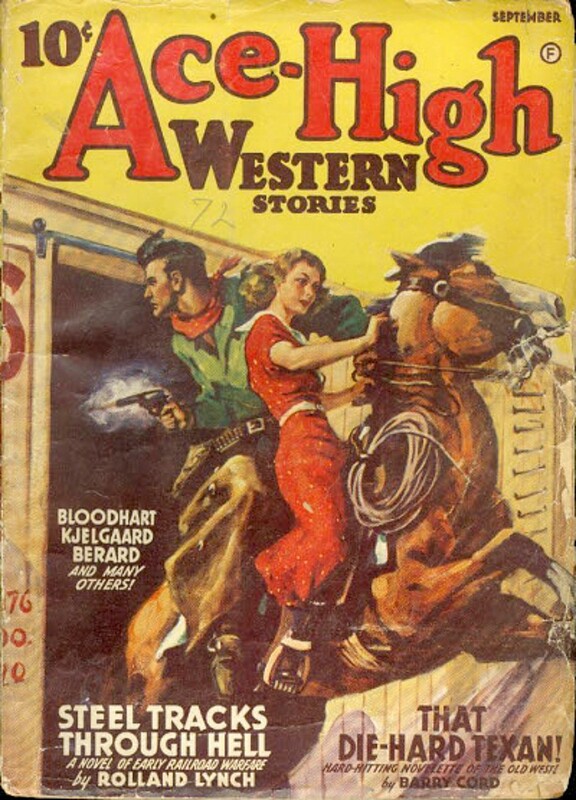 However, if it’s the final part, I’ll sometimes go ahead and read it, and since “Roll, Bright Wagons” by Isabel Stewart Way is a story about a traveling circus in the Old West (a subject that interests me) and wraps up in this issue, I started to read it. However, the character names got the best of me: Blaise Aregood (the hero), Twonnet Juvenal (the heroine), Gus Snavely (the villain—I guess Snidely Whiplash was out of town). Plus the circus is traveling through sheep country, and I don’t read Western pulps to read about a bunch o’ dang sheepherders! And the writing didn’t seem that good to me (despite Way having a long, prolific career as a contributor to RANCH ROMANCES and the other Western romance pulps, as well as an author of nurse novels), so I didn’t finish this one. Rounding out the issue are the usual features and departments, which I skimmed except for a two-page poem by S. Omar Barker, “Cowboy’s Christmas Bride”, which like all of Barker’s work is humorous and well-written. 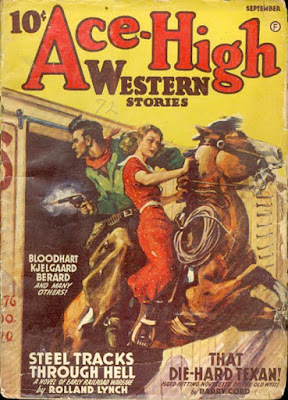 Most of the RANCH ROMANCES I’ve read are from the Fifties, when the magazine was part of the Thrilling Group, but in 1948 it was still published by Warner and edited by long-time editor Fanny Ellsworth, so the tone is slightly different, a little more emphasis on the romance part of the title than there would be later. 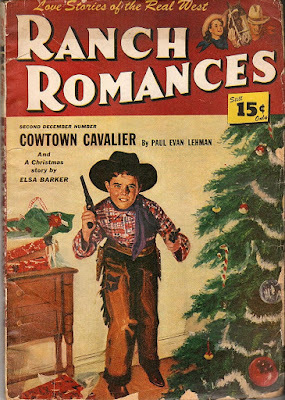 However, the lead story, Lehman’s “Cowtown Cavalier”, could have appeared in any of the regular Western pulps of the era. It’s the best story in this issue, but the ones by Robertson, Barker, and Williams are well worth reading, too. All in all, I enjoyed this issue of RANCH ROMANCES quite a bit and am glad I read it. I was looking for a Western set around Christmas time when I came across this entry in the long-running series featuring Deputy U.S. Marshal Custis Long. LONGARM AND THE COLDEST TOWN IN HELL finds ol' Custis knocked out and thrown off a train traveling across the snowy landscape of Dakota Territory on Christmas Eve. He narrowly survives without freezing to death because he's rescued by a Russian homesteader and the man's beautiful daughter. He was heading for a small town to investigate the murders of several lawmen, and when he finally reaches his destination after that almost-deadly delay, he finds that a gang of outlaws has treed the town. And of course, to make things even more difficult, there's a blizzard going on . 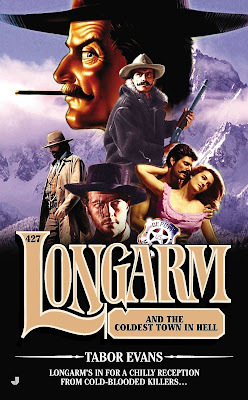 . .
A number of different authors wrote as "Tabor Evans", the house-name under which all the Longarm novels were published. (Heck, I wrote nearly 50 of 'em myself.) The author of this book is none other than the Scourge of the North Country, Mean Pete Brandvold his own self. You know what to expect when you read a Brandvold novel: interesting characters, a vividly described setting, and lots and lots of great action. 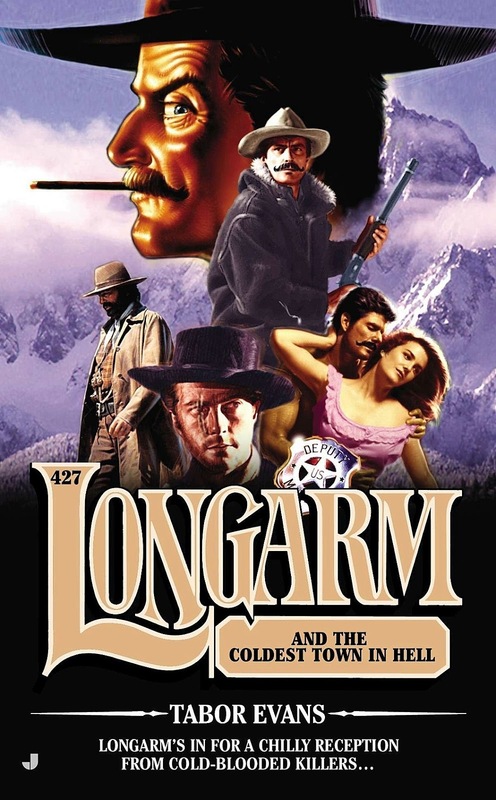 LONGARM AND THE COLDEST TOWN IN HELL delivers all of that and more. I don't think anybody is better than Brandvold at depicting extreme winter weather and making it a vital part of a book. The fact that it's Christmas doesn't play a large part in the plot, but it's definitely there. The biggest thing this book has going for it is Longarm himself. He's a great character, tough and smart and funny and able to carry a series for several decades and more than 400 books. I always enjoyed writing about him, and before that, I enjoyed reading about him. (I was a fan of the series from its beginning in the late Seventies.) I had a great time reading this one, too. The murder of a respected book collector sends Alec Knight and former FBI agent Ravi Khan on a quest to find clues to a buried treasure in an upstate New York town. They soon find they are in a deadly race against a secret Neo-Nazi organization and the mysterious, all-powerful Dr. V. Alec discovers throughout his quest that nothing is as it seems. 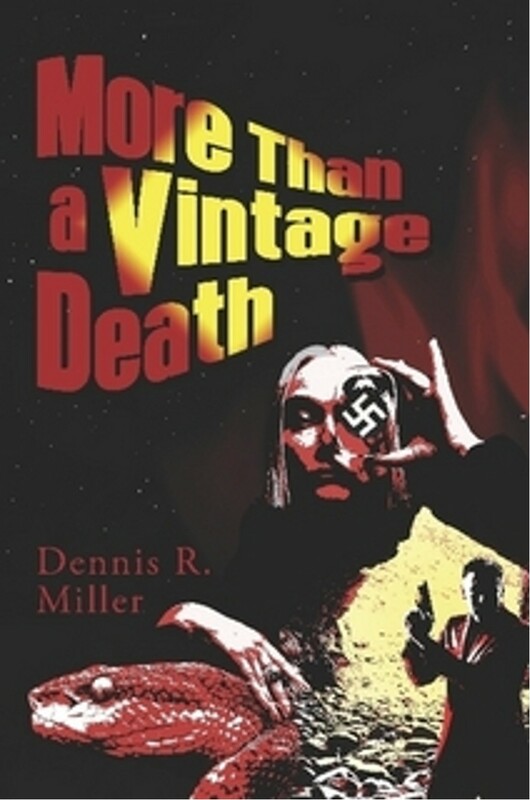 Ripped from today's headlines, More Than a Vintage Death is full of twists, turns, action, suspense and humor. There have been a lot of biblio-mysteries over the years, but I don't recall many that center around vintage paperbacks. 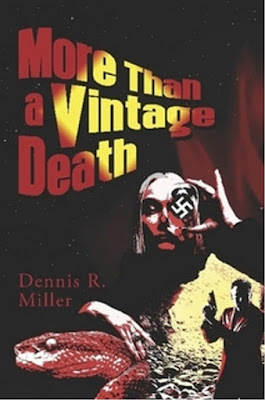 Dennis R. Miller's new novel MORE THAN A VINTAGE DEATH concerns that very subject, and it's not just a gimmick or a Macguffin, either, but rather a vital part of the political thriller/conspiracy plot, which is excellent on its own. However, all the talk about different publishers and lines, how collectors look for books, store books, read books . . . well, it's great stuff for a guy like me. I may not have ever solved murders or searched for hidden treasure, but I've scoured bookstores for Gold Medals and Dell Mapbacks! If you have, too, this novel gets a high recommendation from me. UPDATE: The paperback edition of this novel is available here. I came across this Christmas movie I'd never even heard of before, let alone seen, and it was a fortuitous discovery. The plot involves a homeless man (Victor Moore) who sneaks into a closed-up mansion belonging to a tycoon (Charlie Ruggles) every winter while the right guy is off at his other estate. 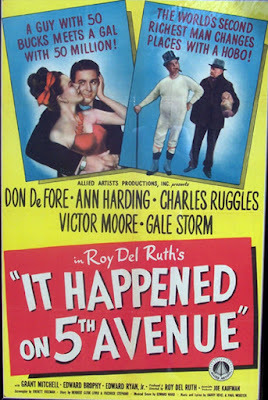 A down-on-his-luck former GI (Don Defore) discovers this and winds up sharing the mansion, and so do some of his GI buddies and their families, all of whom are having trouble finding a place to live due to the post-war housing shortage. Then there's the beautiful young woman (Gale Storm, one of my early crushes) they catch sneaking into the mansion. They believe she's in a bad spot like the rest of them, but she's actually the tycoon's daughter. It's not long before her father finds out what's going on, but at his daughter's urging, he pretends to be a hobo so he can be a squatter in his own mansion and get to know the people who have moved in there. There's also a pending business deal that figures in the plot. This is such a good-natured movie it didn't matter to me that I knew pretty much everything that was going to happen. 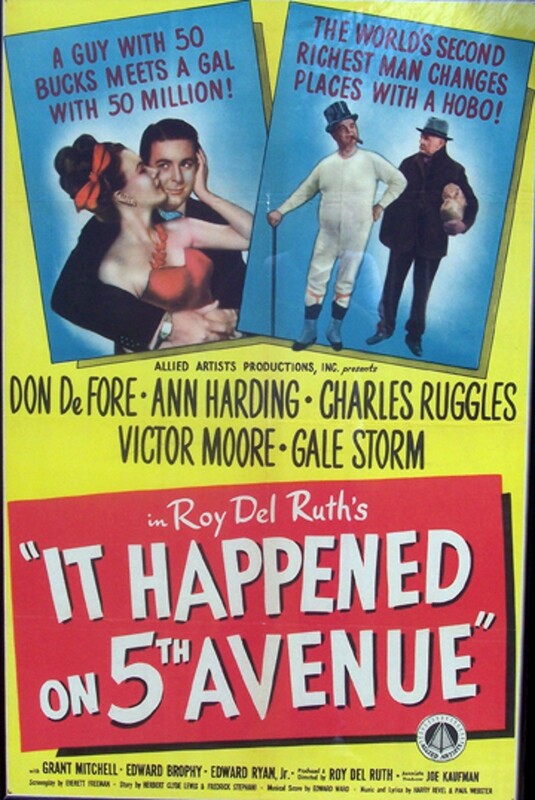 The cast is full of great character actors, including Alan Hale Jr. and Charles Lane. It suffers a little from having Don Defore as the leading man (I'm much more used to him playing the smarmy neighbor in countless movie and TV comedies), but I even liked him before the picture was over. In fact, my thorny old heart was actually warmed. The Christmas angle is actually pretty small in it, but that's all right. It's still a good movie to watch at this time of year, and I'm glad to have seen it. 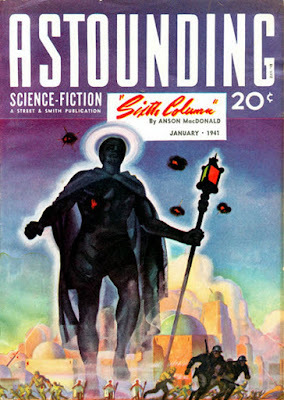 I like the covers Hubert Rogers did for ASTOUNDING SCIENCE FICTION. This one is certainly eye-catching and effective. The lead story is the first part of a three-part serial, "Sixth Column" by Anson MacDonald, better known, of course, as Robert A. Heinlein. I haven't reread anything by Heinlein in years. I ought to. Other authors in this issue are Nelson S. Bond, Eric Frank Russell, Manly Wade Wellman, and L. Ron Hubbard writing as Kurt von Rachen. I don't think the art is great on this issue of ACE-HIGH WESTERN STORIES, but the scene has a really dynamic feel to it that I like. And since this is a Popular Publications pulp, you know there'll be some good authors inside and some memorable story titles (most of them come up with by the editor, no doubt). The authors in this issue include Ed Earl Repp, Barry Cord (Peter Germano), Gunnison Steele (Bennie Gardner), Jim Kjelgaard (of juvenile dog novel fame; one of my favorite writers when I was a kid), Rolland Lynch, Dabney Otis Collins, Ralph Berard (Victor White), and Jack Bloodhart. As for titles, you've got "Steel Tracks Through Hell", "The Gun-Cub's Turn to Howl", and "That Die-Hard Texan! ", among others. I'd read those. Ed Lacy, whose real name was Leonard Zinberg, was one of the top hardboiled writers of the Fifties and Sixties. 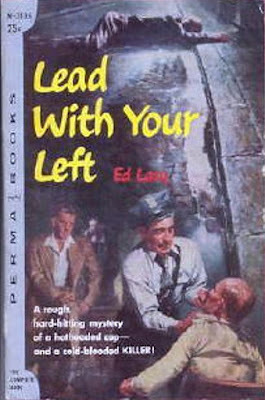 His novel LEAD WITH YOUR LEFT was published first in hardback in 1957 by Harper and reprinted in paperback by Pocket Books. 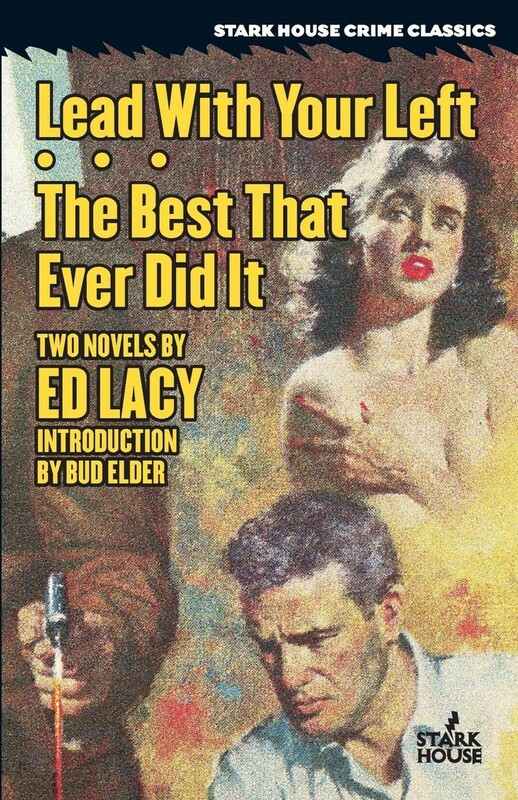 It’s being reprinted, along with another Lacy novel called THE BEST THAT EVER DID IT, in a new double volume from the always excellent Stark House. The protagonist/narrator of LEAD WITH YOUR LEFT is Dave Wintino, former boxer and army vet and, as the book opens, the youngest detective in the NYPD. He looks even younger than he really is, which leads people to underestimate him, but despite his relative lack of experience, Dave is a dogged investigator. He has problems at home, though, with an ambitious wife who doesn’t like him being a cop and wants him to take a job with her uncle, who runs a freight business. Dave is part of the team investigating the murder of a retired cop who worked as a messenger for a brokerage house. The case goes nowhere, and Dave gets somewhat distracted working on a complaint from an attractive young female writer who’s being harassed. Then the former partner of the retired cop who was killed winds up being murdered, too, and Dave is sure that the case is even bigger than it appears to be. So sure that he starts working on it despite being ordered to drop it, risking his career, his marriage, and ultimately his life. Lacy really keeps things zipping along in this one, which, with its Italian protagonist (Italian/Jewish, actually) and abundance of police procedure, reminded me at times of Steve Carella and the 87th Precinct. Dave Wintino has more domestic drama to deal with, though, than usually crops up in the 87th Precinct novels. Lacy does a good job of tying all the strands of the plot together and the solution to the murders is a satisfying one. 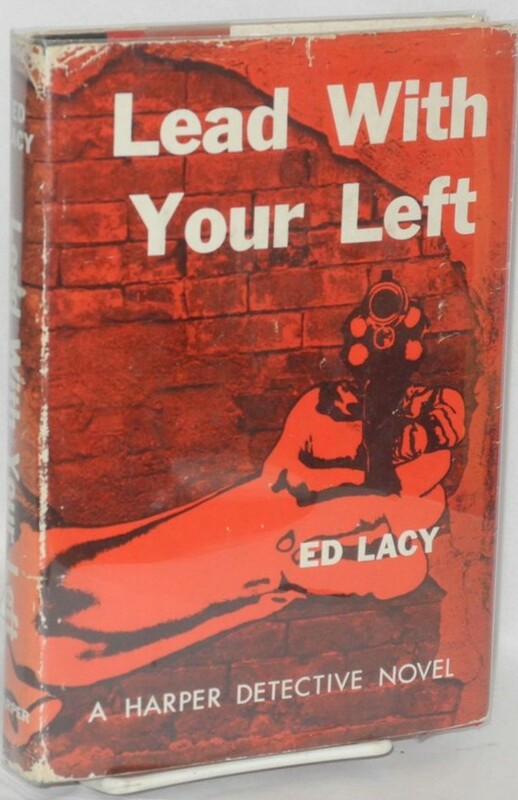 LEAD WITH YOUR LEFT is a very good hardboiled novel from an era that specialized in them. I enjoyed it a great deal and if you’re a fan of the genre, this new Stark House edition is well worth picking up. I was too young for the Golden Age of radio drama (although I’ve heard plenty of great Old Time Radio as an adult), but I was right on time for the Golden Age of Top 40 radio. 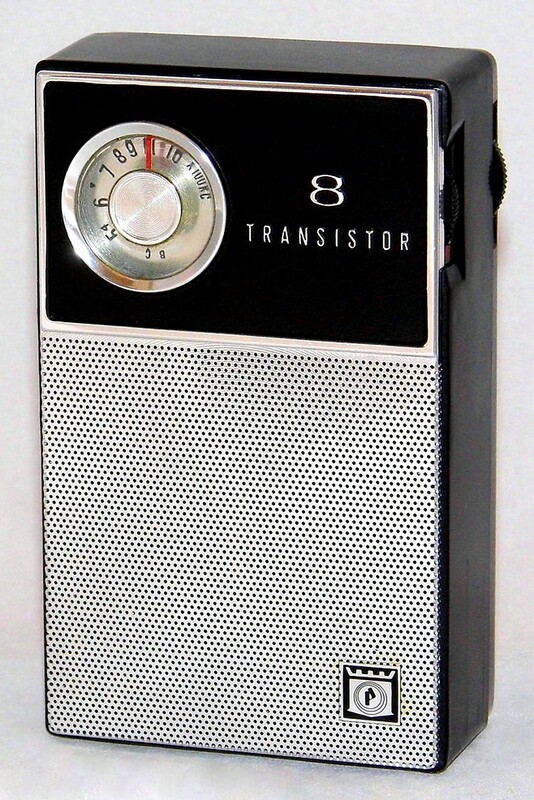 I don’t know exactly when FM radio became popular, mostly in the late Sixties and early Seventies, I think, but in the late Fifties and early Sixties, we were all about AM radio, baby. 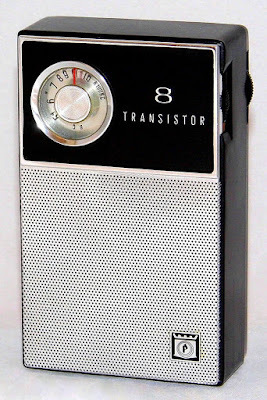 That was the only band on our car radios and the little transistor radios we carried around in our hip pockets. The sound quality may not have been great, but we listened to them all the time anyway. My favorite station was KXOL, 1360 on your radio dial in Fort Worth. There were two popular Top 40 stations in Fort Worth, the other one being KFJZ, 1270 AM. You had your KXOL guys, and you had your KFJZ guys. I was a KXOL guy, through and through. There was also a Top 40 station in Dallas, KLIF, but to be honest, I didn’t know anybody who listened to it. Maybe their signal didn’t get over into our part of the country very well. KXOL had some history to it. George Carlin and Jack Burns worked there as DJs. Bob Schieffer was part of the news department. A couple of national number one hit songs, “Hey Baby” by Bruce Channel and “Hey, Paula” by Paul & Paula, were recorded at a nearby sound studio and had their debuts on KXOL. Paul & Paul were actually named Ray Hildebrand and Jill Jackson and became Christian music artists later on. I saw them perform live at the church I attended, and I’m pretty sure they still sang “Hey, Paula”. I didn’t always get to listen to what I wanted, though. My dad was a TV repairman, and sometimes I’d go with him when he made his service calls. He listened to a country music station, KBOX (I don’t recall the frequency), and of course the announcers pronounced it just as you’d expect, kaybox, except when doing official station IDs. I didn’t really mind, though. I’ve always been able to listen to just about any kind of music. During the summers, I spent a lot of time at my aunt’s house in Blanket, Texas, and while I was there I listened to KBWD out of Brownwood. It still exists, but it’s a country station now instead of Top 40 like it was in those days. I remember sitting on the porch of her house with a transistor playing “Light My Fire” or “If You’re Going to San Francisco” while I was reading paperbacks or going through my aunt’s old copies of THE SATURDAY EVENING POST and reading all the fiction. Another summer, I pretty much lived at my sister’s house, and that was the year I started listening to “Music ‘Til Dawn”, the all-night Easy Listening/Adult Contemporary program I did a blog post about several years ago. Like I said, I enjoyed many different kinds of music and loved what I heard on that program on KRLD out of Dallas. One thing I liked to do during that era was to turn down the sound late at night, press the radio to my ear, and slowly go through the dial, trying to see how many stations I could hear, and from how far away. When I caught the signal skip just right at night, I was able to hear St. Louis and Chicago pretty regularly, and of course XERF came blasting in from across the border in Mexico. It was all English-language programming, mostly religious, but it didn’t have to abide by FCC regulations. Along about the same time, I became a fan of WFAA, a Dallas station that was Adult Contemporary during the day and talk radio at night. It was a sister station of WBAP, a country station in Fort Worth, and they had an odd frequency-sharing arrangement. Part of the day, WFAA was at 570 and WBAP was at 820. Then, after a certain number of hours, they would switch frequencies. I never knew why they did this. I’m sure there was some sort of business or regulatory reason. But it made keeping up with them a little difficult. Eventually, WFAA settled into the 570 frequency, and WBAP took over the 820 frequency permanently, where it still is, I believe. WFAA radio is long gone. But I was a regular listener, especially during college, when I seldom missed the late night talk show hosted by Ed Busch. Radio lost a lot of its charm once I got older and the FM band dominated the industry, although I was a fan of KOAI (“the Oasis”), a smooth jazz station that was in Dallas for a while. And when our daughters were young and I was driving them to school and various activities during the Nineties, I listened to a lot of Top 40 again, only it was their Top 40, not mine. I liked quite a few of the songs, though. These days, we have satellite radio in the car, and I listen to smooth jazz, New Age, classic rock, metal, whatever I’m in the mood for at the moment. Music doesn’t play nearly as big a part in my life as it once did, but still, when the right song comes on the radio, I turn it up. And now and then . . . if I’m by myself . . . and if I hear the opening chords of Three Dog Night’s “Joy to the World” . . . yeah, that’s me bellowing out “Jeremiah was a bullfrog!” at the top of his lungs like an idiot. A happy idiot. EXCITING MYSTERY lasted only three issues (this is the third and final issue), but it looks pretty darned good. I like this cover, and with stories inside by Norman A. Daniels, Sam Merwin Jr., and some Thrilling Group house-names, I'll bet it was pretty entertaining. Labels: mystery fiction, Norman A. Daniels, pulps, Sam Merwin Jr. 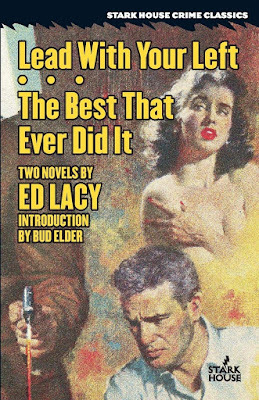 I've seen some goofy covers on SPICY WESTERN STORIES, but this is one of the goofiest. It's eye-catching and I like it, though. Inside are stories by Laurence Donovan, Edwin Truett Long (as Edwin Truett and as Dale Boyd), Allan K. Echols (as T.V. 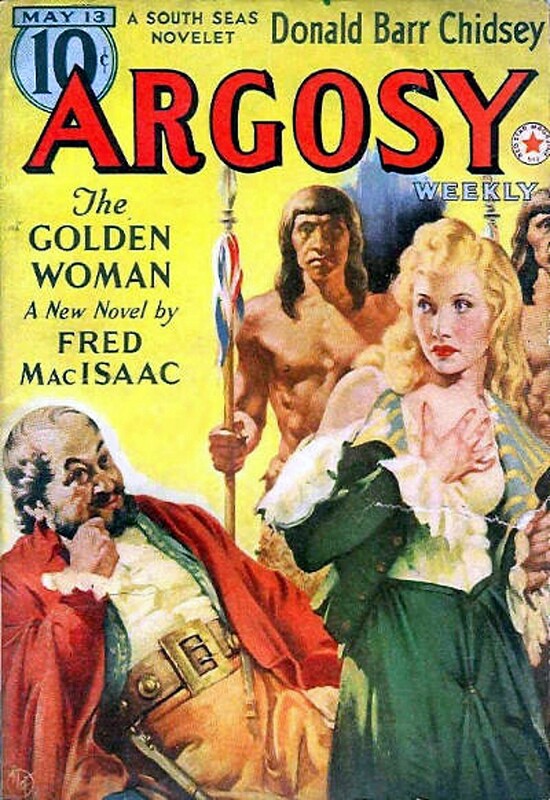 Faulkner, a reprint of "Brother's Keeper", a story from ROMANTIC WESTERN, January 1938, published under Echols' real name), Victor Rousseau (as Paul Hanna, a reprint from ROMANTIC WESTERN, November 1938, of "Woman in Yellow" as by Lew Merrill), William Decatur, and Max Neilson (both house-names). The reprint info comes from the Fictionmags Index, as does the scan, and was provided originally by the legendary Glenn Lord, who knew more about the Spicies than just about anybody else, in addition to all his great work with Robert E. Howard's stories. 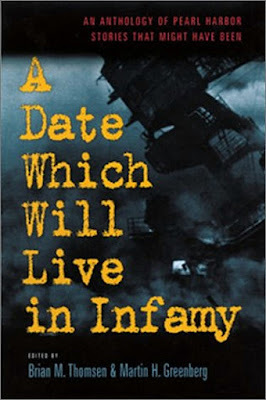 Forgotten Books: A Date Which Will Live in Infamy - Brian M. Thomsen and Martin H. Greenberg, eds. Since today is Pearl Harbor Day, it seems appropriate to write about this anthology of alternate history stories that came out in 2001. 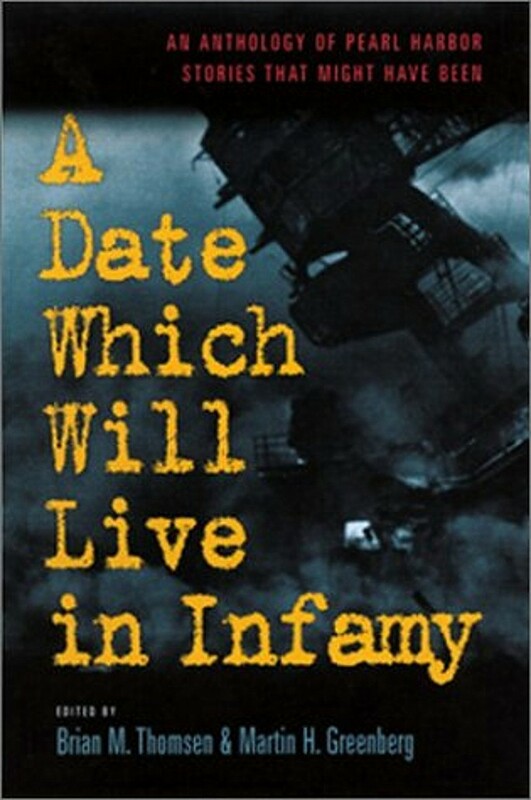 Its full title is A DATE WHICH WILL LIVE IN INFAMY: AN ANTHOLOGY OF PEARL HARBOR STORIES THAT MIGHT HAVE BEEN. I was a regular in Marty Greenberg's anthologies then, since I was writing a couple of novel series for his Tekno-Books, including the World War II series THE LAST GOOD WAR. So I was a natural to be included in this book. For my story, "The East Wind Caper", I brought back Nicholas Lake, a private detective character I'd used one time in a story for MIKE SHAYNE MYSTERY MAGAZINE many years earlier. In this one, I had him doing business in Honolulu and gave him an assistant/sidekick, a Hawaiian nightclub comic, and played the whole thing pretty much fast and lightweight. I haven't read the story in years, but I recall that one of Lake's cases somehow allowed him to prevent the attack on Pearl Harbor. I hope it holds up, but like I said, it's been a long time since I read it . . .
As for the other stories, it's been even longer since I read them, but I remember I thought it was a really good bunch of yarns. You'd expect that with authors such as Ed Gorman, Brendan DuBois, William C. Dietz, Barrett Tillman, and William H. Keith Jr. There are also several essays about Pearl Harbor by Brian M. Thomsen (who edited the book along with Greenberg), William R. Forstchen, Paul M. Thomsen, and Allen Kupfer. If you're interested in alternate history and/or World War II, it's a book well worth hunting up. I've never read any of the Jim Anthony stories, not the early ones by Victor Rousseau writing under the house-name John Grange, or these later ones by Robert Leslie Bellem and W.T. Ballard where he's more of a standard hardboiled detective. But knowing Bellem and Ballard's work, I'll bet the stories are at least entertaining. The cover of this issue of SUPER-DETECTIVE is certainly eye-catching. There are three short stories in this issue as well, all of them under Trojan Publishing Corporation house-names, so there's no telling who actually wrote them. See, that's why I don't like to shave. It gives them dern bushwhackers a chance to sneak up on yuh! 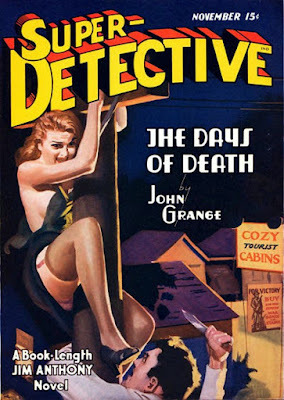 But I do like this cover painted by Joseph Dreany. 5 WESTERN NOVELS MAGAZINE was mostly a reprint pulp. 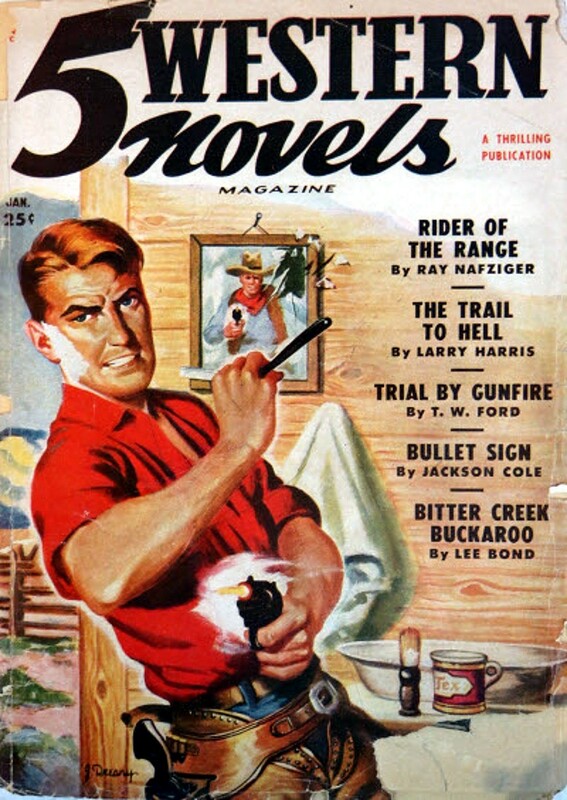 All five of the lead novelettes in this issue were publishing originally in THRILLING WESTERN and THRILLING RANCH STORIES during the Thirties. But with a line-up of authors like Ray Nafziger, Lee Bond, T.W. Ford, Larry Harris, and whoever wrote the story as Jackson Cole, I wouldn't mind the reprints. There are also three short stories, evidently new, by Noel Loomis, Dupree Poe, and John C. Ropke.